This week’s theme is God removes barriers. The story in Acts reminds to not put up barriers,, which can prevent people from relationship with God. Psalm 148 talks about all creation praising God without barriers or limitations. John reminds us of the new commandment to love as Jesus loves – this is the opposite of putting up barriers or stumbling blocks. In Revelation we are reminded that God became flesh to remove the dreaded barriers of sickness, worry, fear and death. This sermon will use two passages of Scripture to show that God wants us to build bridges, not barriers. Note: This sermon builds off the Speaking of Life video “Hinderance”. If you cannot play the video, download the text so you know the point of the video. Introduction: This is my story; you should put this into your own words and use your own examples. I used to be rather legalistic, believing I had to follow a set of specific rules in order for God to see me and to love me. I also believed others needed to follow the same set of rules. I kept a 7th day Sabbath and believed anyone who didn’t wasn’t really a good Christian. I judged people for their lack of diligence, as if I was the example they should follow. I was strict in what I believed and quick to share what I did not like. Sadly, I was known more for what I was against, than for what I was for. Many people view Christians as people who are against a whole bunch of stuff. Churches are often known more for what they are against than for what they are for. It wouldn’t take long for most of us to put together a list of things most people believe Christians are against. Historically, it seems we’ve built better barriers than we have bridges. We’re known more for our animosity against sinners than our love for all people. We are thought of as just another religion with a set of rules that varies from church to church. Is it any wonder Christianity is being marginalized and many people, especially young people, are turned off to Christianity? As was mentioned in the “Speaking of Life” video, we often hinder others in their relationship with God by imposing barriers on people that prevent them from knowing God as he truly is and experiencing fullness of life with him. Now the apostles and the believers who were in Judea heard that the Gentiles had also accepted the word of God. So when Peter went up to Jerusalem, the circumcised believers criticized him, saying, “Why did you go to uncircumcised men and eat with them?” (Acts 11:1-3 NRSV). Peter wasn’t following the rules. Circumcision was a clear barrier to keep others out. If you wanted to be in, you had to become a Jew and be circumcised. But I replied, ‘By no means, Lord; for nothing profane or unclean has ever entered my mouth.’ But a second time the voice answered from heaven, ‘What God has made clean, you must not call profane.’ This happened three times; then everything was pulled up again to heaven. If then God gave them the same gift that he gave us when we believed in the Lord Jesus Christ, who was I that I could hinder God?” When they heard this, they were silenced. And they praised God, saying, “Then God has given even to the Gentiles the repentance that leads to life” (Acts 9:5-18). This vision cut through some pretty significant signs of distinction for Jews—unclean meats and circumcision. All Jews were bound by the Old Testament laws of clean and unclean meats, and all male Jews were to be circumcised. This was a sign of their calling—their relationship with God. And now God was telling Peter neither were necessary for Gentiles. These items were barriers—getting in the way of Gentiles developing relationships with God. Peter’s vision was about breaking down those barriers and building bridges. The apostles and believers praised God for giving Gentiles repentance that leads to life—in other words, for including them. God was much bigger than they anticipated—Jesus’ life, death, resurrection and ascension was much more meaningful and powerful than they imagined. God was for all. It makes you think, doesn’t it, about barriers vs. bridges? It makes you wonder how many things we put in the way of people’s progress in their relationship with God. It makes you wonder if we are creating barriers, when we are called to build bridges—to lead people to the One who redeems all and then trust him to work in their lives. Inviting someone to church: Barriers might include questions about their beliefs, their lifestyle, their habits, or their hang-ups. Jesus came to save sinners—and all sinners need Jesus. We need to build bridges to church, not barriers. Baptism: What barriers do we put up for baptism? Age? How long someone has attended? Their beliefs? Their giving record? Who is qualified to determine if someone is ready for baptism? 3,000 were baptized after Peter’s sermon in Acts 2. Philip baptized men and women in Acts 8. Many were baptized in Corinth. There were no barriers to baptism. It was a personal choice. Communion: Is age a barrier? Are they “ready” or “worthy? Do they know what it’s all about? Again: barriers or bridges? We should welcome all to the table, not find reasons to keep them away. These may seem obvious examples, but Christians have been putting up such barriers since the early church. It’s almost like we are more interested in keeping people out, than leading people in. Perhaps being followers of Jesus makes us a bit prideful or gives us a feeling of one-upmanship. Maybe it’s fear – we aren’t sure we want others in because that may mess up what we have. This leads to the next passage of Scripture, which shows us what the real problem is. When Jesus says there is a new commandment, we should pay attention. The new commandment is to love others as he has loved us. Jesus spent his entire ministry breaking down barriers. He called out the Pharisees time and time again for their many rules and regulations that kept people focused on everything except a relationship with God. He became human to show that humanity was worthy and valuable to God. He endured the most despicable death, reserved only for the lowliest of people, to show that no one was beneath his attention and his love. He ate with sinners, calling a number of them to be his disciples. He changed the way women and children were viewed—showing their value to God. He destroyed barrier after barrier to build the bridge to the Father. If we love as Jesus loves us, we will be just as diligent to build bridges, and much more aware of any barriers we may be constructing. We want others to know Jesus as their Savior, their redeemer, and their friend. We want them to understand that God came and made his home among mortals and that he is dwelling with us until the day comes when tears will be wiped away, death will be non-existent, and pain will be gone. We want others to understand that God loves them just the way they are; and he loves them so much he won’t leave them just the way they are. He is the one who will bring about change in their lives as they get to know him. We want to build bridges enabling others to worship together, pray together, share in communion, build relationship and love as he loves. The only way we can do that is to break down barriers and build bridges. We want everyone to see that there isn’t anything that will keep Jesus from being our God, and us from being his people. We are his and he is ours. What barriers do I face that are preventing me from believing that God loves me just as I am and that he calls me his beloved? What barriers have I built preventing others from seeing God as he really is? 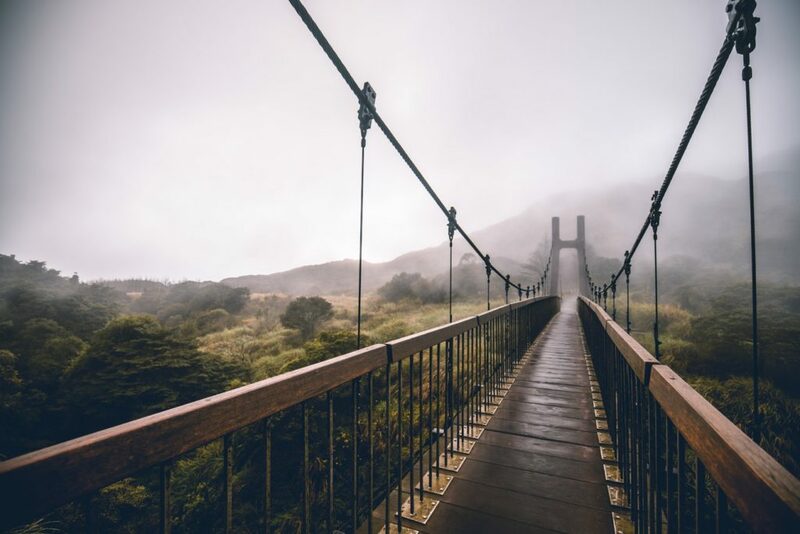 What bridges am I building for others – enabling them to see God and build a relationship with him? What are some things the church/Christianity is known to be against? What are some things the church/Christianity is known to be for? What are some things others know that you are against? What are some things others know that you are for? How can/has making it known what we are against become a barrier? How do we stay true to what the Bible says, and still build bridges for sinners? Can you share how someone built a bridge for you? What barriers has this congregation built – or what impression of barriers is there of this congregation? What bridges do we need to build? How do we build them?